We are ON A MISSION to eliminate racism, empower women, stand up for social justice, help families, and strengthen communities. That’s why for more than 20 years, we have set aside one week in October as a Week Without Violence. This initiative is part of a global movement to end violence against women and girls. This year, from October 15-19, we placed the focus on ending gender-based violence. According to YWCA USA, Gender-based violence is recognized as a spectrum of violence, including but not limited to, intimate partner violence, sexual assault, trafficking, and harassment. Here at YWCA Princeton, we held a Photo Campaign that brought attention to this important issue. 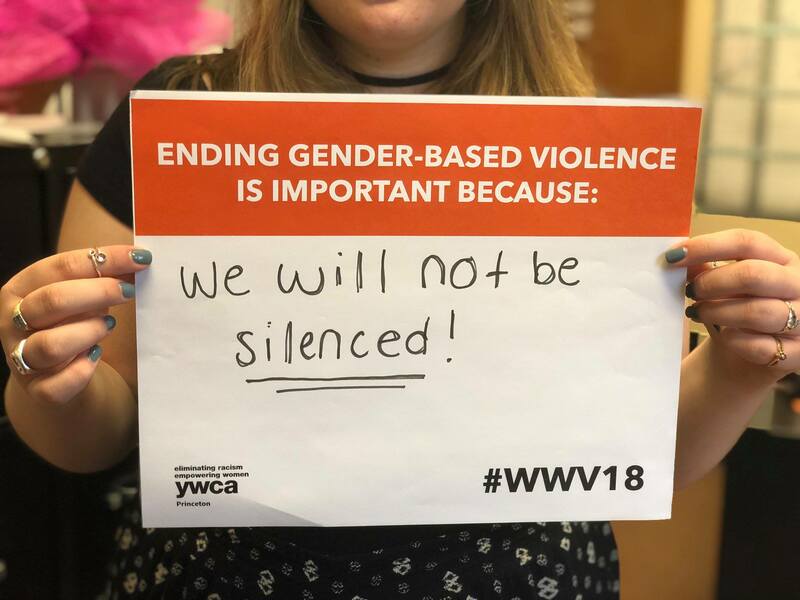 Using YWCA USA’s fillable signs, the campaign helped us raise awareness about gender-based violence, envision a world without violence, and share about the importance of supporting survivors. See Campaign Photos here. Ask questions and find out what their positions are on policies that support survivors. Ask them how they will work to implement changes to end violence against women and girls, and to better provide support and resources. For more information and resources, visit the YWCA USA page.